This year’s Lights-Up evening takes place this Thursday 29th November 2012 and will see comedian Tim Vine hit the switch along with deputy mayor Councillor Lisa Blakemore outside Elmfield House at 6pm. Due to the success of this event and the huge crowds it attracts, the High Street will also be closed to traffic this year, leaving residents to safely enjoy the late night shopping and treats from local businesses. The High Street, Causeway and Church Road will be closed between 5.20pm and 8.35pm with diversions in place: buses will run via Waldegrave Park (near St Mary’s University) and along Waldegrave Road. ‘No parking notices’ will be displayed on these roads (5-9pm enforcement) and a small army of volunteers will help marshal these areas. More info about the road closures from Teddington Society can be found here. Architect’s Gallery is celebrating its 4th anniversary with a new exhibition called Outlands – an open view with a glass of wine 6-10pm. Astrora Coffee will be staying open till late with free coffee tasters, home-baked biscuits and cakes. Bar Estilo are offering mince pies and mulled wine. At Boho Boutique you will be able to shop whilst supping some champagne. Boots will have children’s party games & prizes and will be hosting the Teddington School Jazz Band outside from 6-7pm. La Bottega will be serving tasters of cheese, meats, olives & more. Cafe Teddington will be handing out delicious freshly cooked pizza. La Casa Del Habano will be hosting the annual Treasure Hunt (ages 4-16 yr olds) from 4pm onwards and from 6pm chocolate tasting. Cavan Bakery will be selling Christmas goodies and handing out balloons from both shops. 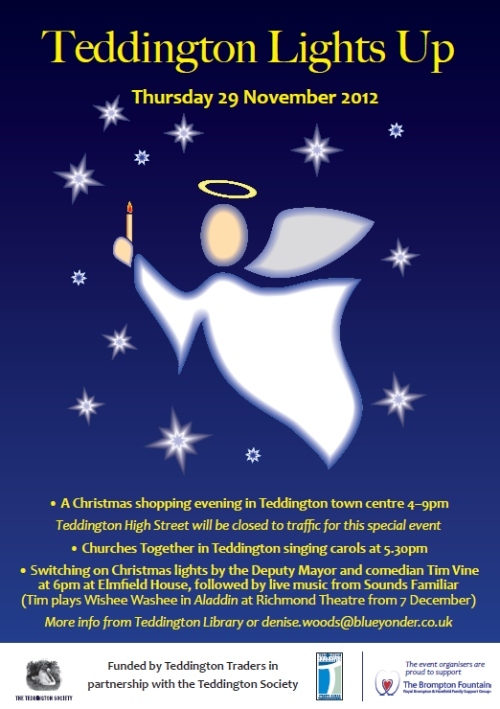 Churches Together in Teddington will be entertaining the crowds with carols at Elmfield House and Cedar Road car park entrance. Cook will be having mini-tasters until 8:30pm with mince pies and mulled wine. Dexters will be offering mince pies, wine and a colouring competition for the kids. Diner’s Delight will have be offering free mezes, homemade pitta bread, lentil soup, home-made bap filled with BBQ spicy turkish sausage. Elements Mini-Me will be open late for goodies and festive hair plus mince pies and Santa on-site! Outside The Fabulous Hat will be dressing as Snow White and a handsome Pirate to create great children’s arm stensils. Featherstone Leigh: free balloons and creating Xmas tree decorations with children, also mulled wine and mince pies. All donations go to Shelter and Scoliosis Association (UK) for Teddington’s Ella Hubbard. Hamptons International have changed their window house ads all into Christmas Trees! These are all created by the kids at Hampton Wick School and you can vote for your favourite on the night. Happy Potter are hosting an indoor Craft Fair from 5pm – lots of stalls from local craft creators with a free glass of fizz and treats. Heel for Leather: champagne and mince pies for customers whilst browsing stock and clearance items. The Kings Head will see Santa and his RNLI Lifeboat nearby on the High Street. Jenny Blanc, home of the popular Christmas window display will be having a late night shopping evening with lots of ideas for decorating your home for the festive season, along with a glass of fizz! Kitchen Sync: cookie decorating for children, mulled wine and promotions. Santa and his sleigh will also be nearby on the road. The Loft are offering 15% discount on the night 6-9pm. LS Hair have a grotto complete with a Christmassy throne for Santa to sit on and hear present wish-lists. Mackenzie Gallery will offer sparkling wine and nibbles and a raffle in aid of Teddington Memorial Hospital: 1st prize £50 Gallery gift voucher. Marks & Spencer will be offering their usual food tastings. Mela Mela will have the free raffle of the 2012 Harrods Bear ‘Chester’ and will be providing pink bubbly & nibbles. Moidul’s of Teddington are having a Bollywood evening with Bollywood dancers and music, handing out tapas and cocktails. The Causeway will see the Movement Warriors kids dancing workshop, hop-hop & breaking. Circus skills – activities for kids, juggling, clubs, rings, close-up magic & stilt walking. Also street food, crepes & Tartiflette 6-8pm. NappyValleyNet are in the High Street where you can WIN a Teddington Christmas worth over £500. They will also be giving away balloons to all your little ones. Nearest Cafe will be having a delicious hog roast. Park Lane Stables will be offering reindeer rides with their ponies at the Kings Head car park to raise money for The Brompton Fountain. Pony Club members will also be selling home-made craft items. Physio and Therapy will have ‘Mini Massages’ & free chocolates for children, open until 8pm. Play Inside Out will see the return of the hugely popular Santa’s Grotto and face painting 5-7pm. Retro Bistrot will be having an upmarket soup kitchen – serving superb soup and homemade bread. The Royal Oak will be offering their gourmet burgers and fries for £5. Free samples of Paulaner Hefe-Weizen are also on offer. Shambles are offering their Amaretti biscuits, freshly baked break and will be selling bespoke Italian Hampers and Pantry Gifts at 10% discount from Shambles Shop. Simply Me Beauty will be holding a Christmas Shopping Evening – treatment launches, demonstrations and product offers along with mince pies and a glass of prosecco. Environ skin analysis, expert advice, 3 for 2 on all products, expert advice, Christmas gifts. Simply Skin 4-8pm for festive fun – free biscuit decorating for children, free mini Dermalogica hand and lip treatments, exclusive offers & make-up artist Victoria and Physiotherapist Anne available for free help, advice and free treatments. Sims Opticians will have sweeties and mince pies together with a large amount of Christmas cheer. Spa Nails are running a competition to Decorate a Nail. Stepping On Out – cards & calendars designed & produced by the adults with learning disabilities who run the shop. Big Tombola & a children’s game, mince pies and other snacks. At Stevens Tyres there will be a free lucky dip for children, free raffle for adults: prizes include Hunter Four Wheel Alignment, Michelin goody bag, air compressor, ice-scrapers and more .Advice on tyre-safety, nibbles and drinks. St Peter and St Paul Church will be open for contemplation. Studio148 will be celebrating their 1st Birthday on Lights-Up evening, offering 20% discount on everything and a complimentary drink (champagne/wine) & cupcakes, open until 7:30pm. The TBC indoor Christmas Market will be taking place at Teddington Baptist Church on Church Road 5-8pm. Local businesses and charities will be taking part with stallholders including jewellery, festive food, craft items and Christmas decorations. Outside in Church Road there will be street music from Endurance Steel Orchestra, bell ringers and BBQ food. Teddington & Hampton Wick Voluntary Care Group will have a stall in the High Street and a young local boy is bringing his guinea-pigs! The Teddington Arms have two bands playing, roasted chestnuts, mulled wine and cider: open until midnight. Teddington Library: seasonal stories and more for 3–8 year olds from 4pm. Teddington Pools, Fitness Centre & Sports Hall in the High Street, with information about facilities and activities. The Teddington Society will have a table in the High Street with mugs, cards and a prize draw. Teddington Tandoori will be serving a selection of Indian snacks. At TCS there will be a prize draw for a Herkimer Diamond bracelet. Vet4Life will have homebaked dog biscuits, mulled wine and a fun competition planned. At Vidatherapy there will be £10 manicures and on-sight massage & reflexology with mulled wine 6-8pm. Waterstones: reading & signing copies of Littlest Star by Richard Little. Local artist Laura Wilson will be presenting a selection of her paintings (6-7:30pm). Finally many local societies and organisations will have tables on the street including Friends of Bushy & Home Parks, Beavers, Scouts and Girl Guides, TLC Family and TotallyLocallyTeddington which will be officially launching their shoplocal campaign on the night. Teddington road closures: An actual map showing alternative roads I CAN use from Hanworth to Kingston on the evening of Nov 29 would help!! Could have been arranged over the weekend! Agreed! A map would be very helpful! My Guinea Pigs when do a treat!